Lovely simple article... Amazing what can be seen visually depending on the graph. 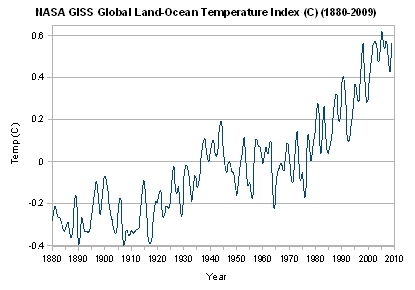 Just shows that the temperature increse we have seen is not a modern, post-WWII thing, but a gradual increase since, in this graph, 1880. Utter piffle. Temperature is a macroscopic variable that represents the amount of thermal energy in a system. So if we are doing any temperature comparisons we must use the Kelvin temperature scale. Assuming the average temperature of Earth is 15 C (288K) and that the temperature has increased by 1 degree C (1 K) then the percentage increase in energy (or temperature if you like) is 1/288 = 0.35% or 3.5 parts per thousand. That's how much variation we are talking about.